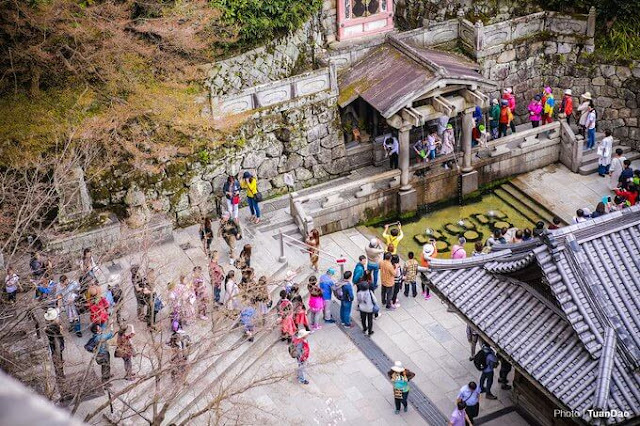 Kiyomizu Dera is a place that visitors can not ignore when visiting the ancient capital of Kyoto, Japan. 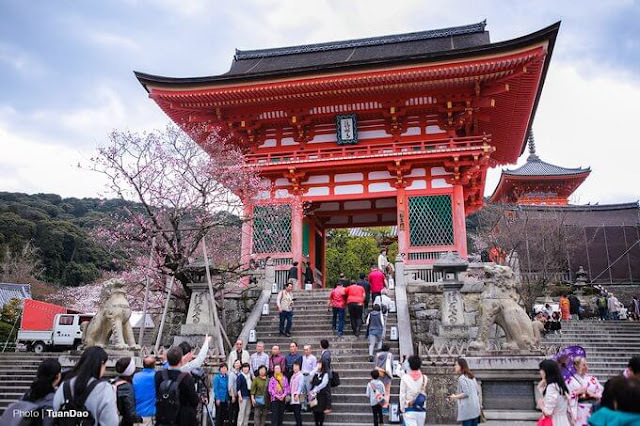 As one of the ancient temples retained from the Nara period (710 - 794), Kiyomizu Dera is a large area with special architectural design and it always attracts tourists visiting Kyoto. 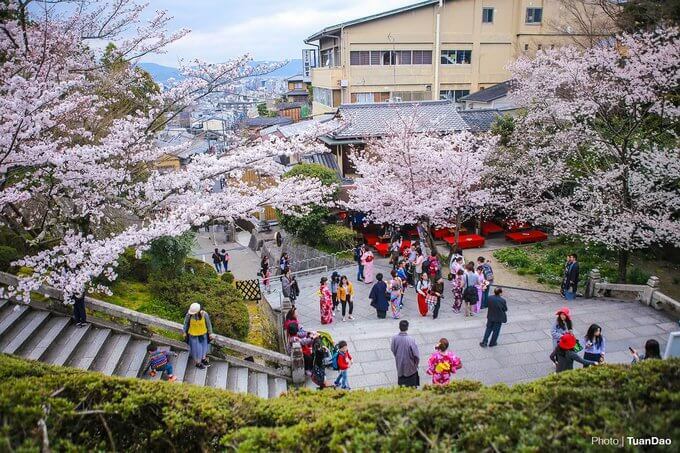 The time of cherry blossom blooming is considered the peak season of visiting the temple when the number of guests is always crowded. The entrance to Kiyomizu Dera, painted in red orange, stands out against the always-green sky in Japan. Before going to the temple, visitors will wash their hands and gargle in a large stone water tank called temizuya located on the Sando Road. This action means washing yourself before entering the temple. 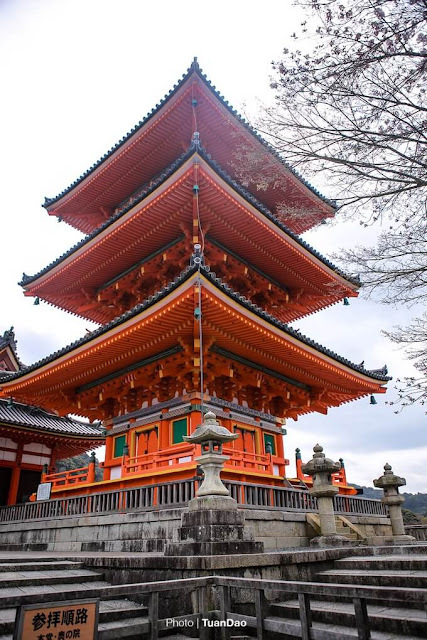 Kiyomizu Dera is built on a cliff, the front of the main power is on a high station made of 139 wooden posts 12 meters long, the structure of the column intersection sure. The temple has two love stones. Legend has it that if you close your eyes and walk from this rock to the other, you will find true love. For those who have a lover, if you close your eyes think about your lover and touch the stone, love is stronger. 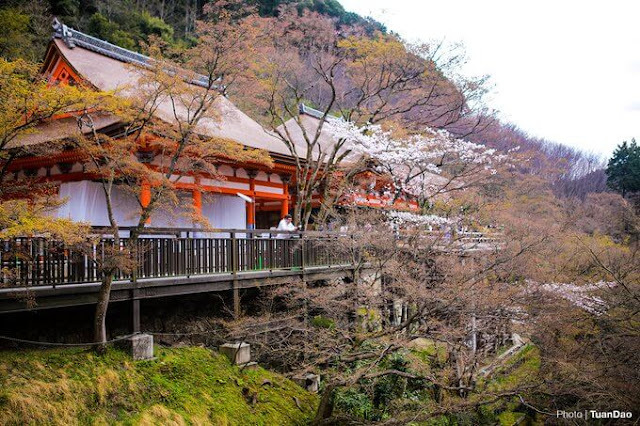 At the foot of the mountain is the holy Otowa Stream with three streams symbolizing longevity, success and happiness. Tourists can drink water form these streams to pray for their dream to become true.